Greetings in the Lord! Thanks for visiting the Calvary Chapel Mansfield website. I would like to extend a personal invitation for you, your family and friends to come and visit Calvary Chapel, located in North Central Ohio, an affiliate of Calvary Chapel Costa Mesa, CA. I hope as you visit us, you will feel loved and welcomed by the Body that fellowships at Calvary. 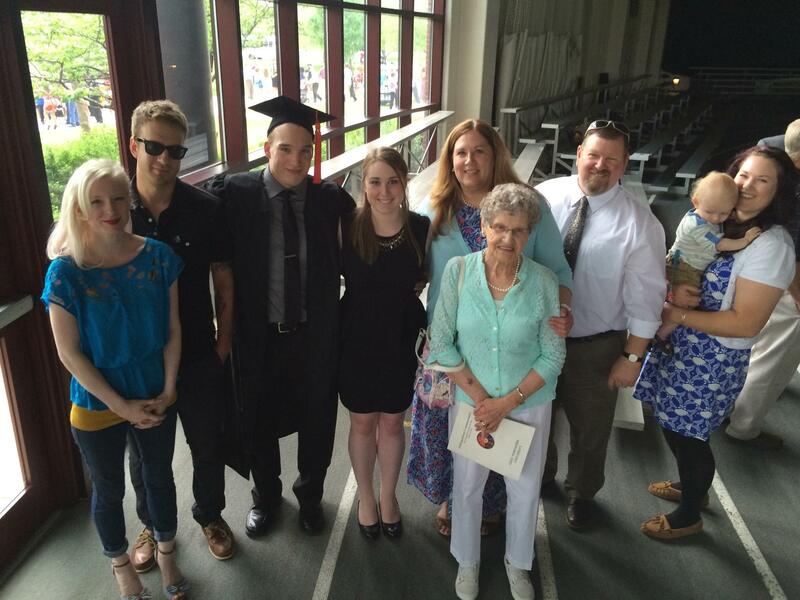 The Schatzinger family at Jared's commencement ceremony. Planted in September of 2000, Calvary Chapel Mansfield is committed to the making and maturing of disciples for the Lord Jesus Christ. We are a non-denominational church centered on the teaching of God's Word for the purpose of equipping His saints for service. We combine this with Christ-centered contemporary worship, in the hope of leading God's people into a deeper, more intimate walk with their Creator. Calvary Chapels across the world are known for their dedication to verse-by-verse teaching of the Word of God kept in balance with the Spirit's power to instruct and empower the believer's life. We pray, as the Lord would lead, that you will come and worship with us soon!